Egypt's Golden Empire is part of amazing documentary series Empires that recounts the tale of ancient civilisations from Greece to Egypt or to more contemporary times eras such as Feudal Japan or Napoleon Bonaparte. This DVD focuses on one of the most complex and enduring empires of recorded history, that of ancient Egypt and features a variety of dynasties. The documentary is narrated by Keith David, an actor who starred in movies such as Pitch Black and the Chronicles of Riddick. David does a remarkable job at recounting the tales of ancient Egypt whose voice is perfectly suited for this series without over emphasising or being too monotone. The DVD features all three episodes from the series with the first episode entitled Warriors Pharaohs which sets the stage for the entire series with some of the most famous rulers of ancient Egypt. From the vicious battle between the Nubians and the Egyptians to the formation of the New Kingdom are just some of the segments that are contained in the first episode. Episode two is entitled Pharaohs of the Sun and recounts the story of Akhenaton who made sacrilegious changes to the religious system of ancient Egypt by removing all gods with the one true god. The second part of the episode features Tutankhamen, one of the most famous and short-lived rulers of ancient Egypt who was believed to have been murdered. The last episode is entitled The Last Great Pharaoh and goes into great depths of one of the mightiest Pharaohs of all time, Ramesses II. This series focuses on specific incidents and timelines of the Egyptian empire but gives the viewer an in-depth view of this amazing culture. Before the Romans were in Rome or the Greeks built their mighty empire, there was one empire who ruled them all, the ancient Egyptians. As with the previous series in this amazing documentary, the video quality of Egypt's Golden Empire is quite exceptional for a documentary series. The series is also presented in an aspect ratio of 1.78:1 (16x9 Enhanced). 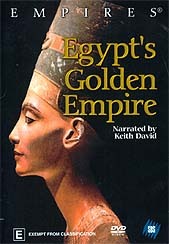 The audio quality of Egypt's Golden Empire is quite clear and audible that is accompanied by a brilliant musical score to help draw viewers into this rich and powerful empire. The series also supports Dolby Digital 2.0 stereo. There are no extras contained on this DVD series whatsoever. Egypt's Golden Empire is probably my favourite series of the entire Empires documentary and gives viewers a brilliant re-enactment of this ancient culture. From the strangely deformed Akhenaton to the boy pharaoh Tutankhamen and the powerful Ramesis II who was believed to be the same pharaoh that Moses encountered, this is one series that should be in everyone's collection.